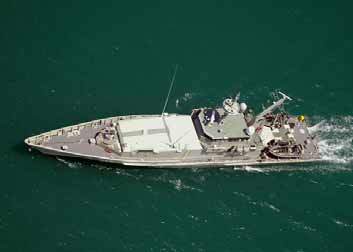 The Royal Australian Navy’s (RAN) patrol boats are one of the most flexible and versatile elements of the Australian Defence Force (ADF). Every day they are at sea policing Australia's maritime domain and protecting our sovereignty, resources and national interests. Involved as they are in the enforcement of Australian legislation relating to illegal immigration, fishing, quarantine and smuggling, patrol boats maintain a fairly high public profile. Indeed, the fictional HMAS Hammersley continues to star in the high-rating TV drama Sea Patrol. It was the RAN’s experiences during Indonesian Confrontation (1963-6) which led to the reintroduction of patrol boats into the fleet. Existing minor war vessels, such as the Ton class minesweepers, had performed well in the patrol and interdiction tasks which featured in the conflict, but their engines were not designed for loitering and the ships had proven expensive to maintain. Guided by the experience, the RAN let a contract for 20 locally-designed Attack class patrol boats in 1965. By the time the boats entered service Confrontation had reached a negotiated end and, rather than combat, the boats were instead directed towards the newly prominent role of Australian coastal surveillance, as well as for reserve training. The 15 Fremantle class patrol boats (FCPB), which replaced the Attacks in the early 1980s, were likewise devoted to fisheries protection and coastal surveillance, although early plans did include proposals for the inclusion of modern gunnery systems and a missile equipped variant. 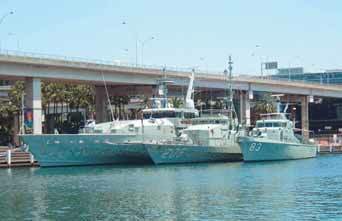 From left to right, Armidale, Fremantle and Attack class patrol boats are seen together in Darling Harbour (RAN). Replacing the FCPBs, the larger Armidale class patrol boats (ACPB) first entered service in 2005 and the RAN now operates 14 of these vessels. Each is just under 57 metres in length, of 305 tonnes displacement and has a draft of around 2.5 metres. They are operated by a ship’s company of 21 with space to accommodate up to 29. To increase their available patrol days the ACPBs are multi-crewed, with a target ratio of three crews for every two patrol boats. There are ten boats home ported in Darwin and four in Cairns, but the ACPBs may also be deployed for short periods across the Indian and Pacific oceans. In future, the ACPBs improved crew employment concept may incorporate crew changeovers remote from homeport. Environmental conditions. ACPBs are normally limited to operations in less than sea states 5, and experience difficulty in conducting boarding operations in seas exceeding 2.5 metres. Range: Fuel capacity and provisions storage limit range. Crew: Most evolutions involve a significant number of the crew. High-intensity operational periods must be interspersed with adequate opportunities for rest. Self-protection: The stabilised 25mm gun of the ACPB provides a limited offensive and defensive capability. Despite its improvement over the older 40mm weapon fitted in the Fremantle class, the 25mm does not greatly increase self-protection in a high-threat warfighting environment. The ACPBs are especially susceptible to attack from air to surface weapons. Survivability: The ACPB is not designed with combat survivability as a prime consideration however the crew are capable of standard naval damage control actions. In seeking to illustrate the span of maritime tasks, Australian Maritime Doctrine: RAN Doctrine 1 defines the three roles normally undertaken by maritime forces. These are described as the military (or combat related), diplomatic (or foreign policy related) and constabulary (or policing related) roles. The remainder of this Semaphore will look at how our patrol boats directly contribute to these broad roles and their subordinate tasks across the spectrum of maritime operations. It should be kept in mind that these descriptions are representative rather than specific, since it is often the case that more than one of the roles and several of the tasks will be carried out simultaneously. The degree of force employed in combat operations is defined primarily by the national interest. Compared to major surface combatants, the ACPBs are relatively simple and do not carry sophisticated sensors or overly powerful weapons. Nevertheless, the ability of the ACPBs to undertake constabulary and diplomatic roles depends substantially on their ability to carry out their combat role. In some circumstances, ‘patrol combatants’ will represent a cost effective littoral warfighting asset. They are particularly suitable for inshore operations – at choke points, in estuaries and in other shallow waters where larger units often have restricted access. In the absence of high-level threats, they can contribute significantly to local patrol, response and surveillance efforts. Suitable tasks might include intelligence gathering, interdiction, boarding and the landing of small parties of Special Forces. Recent regional conflicts illustrate how ACPBs might be used. In Sri Lanka, for example, we have recently witnessed a return of hybrid-threats, such as massed attacks by small craft and infiltration by terrorists using small boats to enter secure areas. Through the effective use of their patrol combatant force the Sri Lankan Navy played a decisive role in defeating the insurgency and bringing an end to the separatist conflict. HMAS Pirie photographed in the Yellow Sea during a South East Asian deployment in April 2009. Together with the tanker, HMAS Success, the patrol boat took part in the Chinese Navy’s 60th Anniversary and International Fleet Review at Qingdao (RAN). Naval diplomacy, or the use of naval forces in support of foreign policy, provides context for those maritime tasks primarily designed to influence the policies and actions of other nations. Tasks undertaken within this role may range from the benign to the coercive depending upon the context. One important aim of such operations is to develop conditions which will allow the successful conduct of combined maritime operations in the future. ACPBs routinely undertake combined patrols, training exercises and ship visits throughout the region as a form of Defence cooperation and to demonstrate Australia's enduring interests in our maritime neighbourhood. In addition to providing humanitarian aid and disaster relief where appropriate, Australian patrol boats will often offer assistance with maritime surveillance to smaller regional nations, most of which have very limited maritime patrol capabilities of their own. Again, there will often be occasions where patrol boats can achieve desired outcomes more efficiently and economically than larger warships or land forces. This can be particularly significant in times of uncertainty and crisis where, due to their smaller footprint and less threatening presence, a small number of Australian sailors may be able to achieve more in difficult diplomatic circumstances than an equivalent unit of soldiers. Operations with allied and friendly navies also include participation in exercises with Indian and Pacific ocean nations ranging from larger exercises, such as the Exercise BERSAMA series under the Five Power Defence Arrangements, to smaller regional exercises, such as those conducted with Pacific Island nations. Constabulary operations function within the framework of domestic law and Australia’s international law obligations, and hence the amount of force that can be applied must be strictly in accordance within the mandate given. These tasks are the regular fare of patrol boats and range from the routine maintenance of good order at sea through to the active enforcement of Australian sovereignty. Such tasks, which are unlikely to require the use of force, include search and rescue and environmental and resource management. Patrol boats have undertaken biological studies of Australia’s coastal reefs, the launching and recovering of meteorological instruments at sea, and regularly collect, record and report environmental data. Armidale class patrol boats at HMAS Coonawarra (Darwin) ready for the next surge of patrol activity in Australia's northern waters (RAN). Further up the threat scale, ACPBs contribute to the national task of fisheries protection as part of the Border Protection Command (BPC) managed national effort. Other tasks for BPC involve maritime barrier operations, which include the prevention of illegal immigration, supporting anti-smuggling operations conducted by Federal and State police agencies, and assisting in Australia’s quarantine effort. Currently there are seven ACPBs assigned to Operation RESOLUTE, the ADF’s contribution to the whole of government effort to protect Australia’s borders and offshore maritime interests. Two additional ACPBs are available should the threat level warrant further response capability. Each year Australian patrol boats respond to hundreds of foreign vessel sightings. They routinely intercept and board vessels suspected of breaching Australian laws. Examination and inspection by trained and experienced patrol boat boarding parties may result in the apprehension of the vessels concerned. Patrol boats are also useful for peace operations, which can be among the most difficult of constabulary tasks. 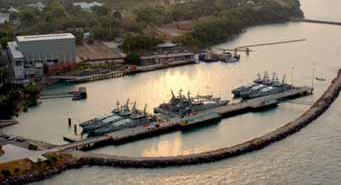 Several played a significant role in the restoration of order to the Solomon Islands during Operation ANODE (2003-04). Australian patrol boats were deployed throughout the country conducting patrol and response duties, participating in the confiscation of weapons, and visiting outlying islands to educate communities on the restoration of order and process. The 2009 White Paper has directed that when the ACPBs reach the end of their useful life, they will be replaced by a new type of 'Offshore Combatant Vessel'. No matter what these future vessels are designated, the need for patrol boat capabilities will endure. ↑ Royal Australian Navy, Australian Maritime Doctrine: RAN Doctrine 1, 2010, p. 99. Forthcoming. ↑ Sergei DeSilva-Ranasinghe, ‘Maritime Counter-Terrorism and the Evolution of the Sri Lanka Navy’, Headmark, Dec 2009, pp. 35-7. ↑ P Laurence and D Stevens, 'The Royal Australian Navy and the Restoration of Stability in the Solomon Islands', in A Forbes and M Lovi, (eds. ), Australian Maritime Issues 2006: SPC-A Annual, Sea Power Centre - Australia, Canberra, 2007, pp. 83-7. ↑ Department of Defence, Defending Australia in the Asia Pacific Century: Force 2030, Canberra, 2009, pp. 72-3.